Mixing camping trips with country walks is easier than ever thanks to a new series of route guides from the Camping and Caravanning Club that can be downloaded and followed in the ViewRanger app. Walking is the number one activity for the Camping and Caravanning Club’s 600,000 members, which is why they’ve partnered with ViewRanger to create a series of interactive route guides that start and finish at more than 30 campsites around the UK. Iconic outdoor locations such as the Lake District, Peak District, Scottish Highlands and Snowdonia are all featured – with other highlights including the forests of Cannock Chase, the Devonshire coast and the historical sites of Salisbury – and every route is available to download and follow for free on your smartphone. Camping and Caravanning Club print editor Stuart Kidman said: “We’ve devised a series of circular walks from a number of our UK Club Sites, so members can enjoy tailor-made routes directly from their pitch. Along the way they’ll find points of interest including ancient monuments, natural wonders, picturesque views and often the promise of a good pit-stop at a pub or café. There are currently 35 Camping and Caravanning Club route guides available in ViewRanger, allowing app users to see their precise GPS location updating on digital maps as they walk. More Camping and Caravanning Club routes will be published over the coming months, so keep an eye out for further announcements. To follow the routes on your smartphone, tablet or smartwatch, simply download the free ViewRanger app from the Apple App Store or Google Play, then either search for 'Camping and Caravanning' routes in the app or click this link to explore the full collection. Download Camping and Caravanning routes here. Learn more about publishing routes with ViewRanger here. ViewRanger is a free GPS navigation app used by millions of people around the world to plan, navigate, and share outdoor adventures. Combining the world’s best offline maps with easy-to-follow route guides, advanced GPS navigation features and augmented reality, ViewRanger is the ultimate adventure tool for anyone exploring the great outdoors. The Camping and Caravanning Club was established in 1901 and is the world's oldest and largest club for all forms of camping. 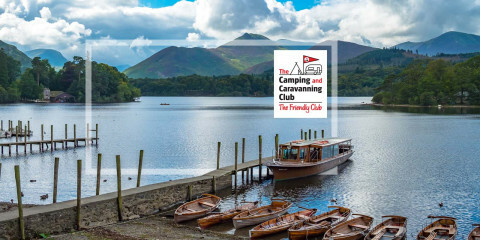 With over 100 club sites set in some of the UK’s most picturesque locations, the Club’s aim is to help people enjoy the simple pleasures that camping can bring – with over 600,000 members who agree with that notion.